William Bruce Cameron (born 1960 in Petoskey, Michigan) is an internationally known humor columnist. He is the author of 8 Simple Rules for Dating My Teenage Daughter, a best selling self-improvement book adapted to the ABC sitcom which aired from 2002 to 2005. 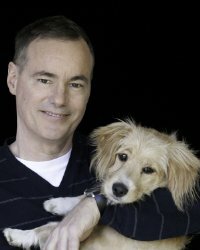 Bruce joins us in the studio to talk about two books; his New York TImes besteller "A Dog's Purpose" and his latest offering "Emory's Gift"
This man is funny and his writing style is extremely engaging, just like all the characters in his books.